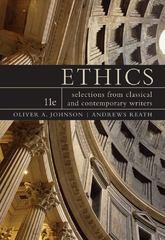 Ethics 11 Edition The most important moral philosophers of the Western tradition all in one place! Chronologically organized to illuminate each writer's role in the history of ethics, the book's comprehensive coverage fosters a firm grasp of ideas in the history of Western moral philosophy, as well as contemporary moral philosophy. Selections from the contemporary period are designed to highlight the continuity between the history of moral philosophy and contemporary moral theory. The collection includes an introduction to ethical theory, introductions to each of the major historical periods, brief introductions to each selection, and new study tools to help focus your reading.